What makes an editor leave in a comment such as “Jewish people are good with money”? And what makes the main presenter not pick up such a comment? This was the scenario in Chris Tarrant’s Extreme Railways shown on Channel 5 on Monday night when Tarrant visited Jordan and Israel. In Jordan he travelled the route of the now defunct Hejaz Railway and visited Petra. He said there’s more money in Israel and, thus, better railways than Jordan and explained Zionism in terms of the spiritual home of Jews for thousands of years. But he described the railways as helping to bring thousands of “settlers” into Israel when referring to those Jews. Tarrant described railways as the centre of tensions between Arabs and Jews dating back to the “second Arab revolt” (1936 to 1939). He described that revolt being due to Arab frustration at the influx of Jews. There was no mention of the Peel Commission in 1937 that offered Arabs a state on 80% of the land and which they rejected and the Jews accepted. And no mention of the revolt leading to the closing of the doors of British Mandate Palestine to Jews in 1939 which contributed to six million Jewish deaths by the Nazis. Tarrant merely continued that Jewish groups then attacked the trains in the 1940s due to being frustrated by the British. In Haifa he visited a Jewish hummous restaurant the owner of which, Adam, he described as an “upstart”, although he enjoyed Adam’s hummous. Tarrant merely replied “Arabs are good with hummus.” It was a totally free pass for an old antisemitic trope. Despite describing Israel as “war torn”, “on an almost constant war footing” and saying, when trying to board a train with soldiers, “machine guns add to the stress of the morning commute”, Tarrant enjoyed Haifa. Nothing about Arab rejectionism of partition for the second time in 10 years before five Arab countries attempted to annihilate Israel at birth. So Hamas were now given a free pass. No mention of Hamas’ violence, its antisemitic 1988 Charter and the oppression by it of its own people in Gaza. Finally to Jerusalem and to what Tarrant called “the Wailing Wall”. Having briefly layed his hand on the Wall with a look of utter bemusement he was more intent on showing us another wall. He took a journey on the Jerusalem Light Railway and then gratuitously gave us the haters’ narrative that some see the railway as a “typical act of Israeli aggression as it runs through illegal Israeli settlements on Palestinian land”. He acknowledged that others see it as a great place for people of all races and religions to get together. No, Chris. You should have blamed the problems on Hamas violence and Arab rejectionism but you gave that and an ancient antisemitic trope a free pass. Oh, Mehdi, feel free to tell us to “bugger off to Tel Aviv”. It was in response to Hasan’s article the previous day If you lived in Iran, wouldn’t you want the nuclear bomb? which some commentators have interpreted as a call by Hasan for Iran to develop a nuclear bomb. Can you imagine the media reaction if a British Jew wrote a column about Israel which prompted the response of “bugger off to Tel Aviv”? I can’t see the parallel myself. Hasan isn’t Iranian and neither does Bozier’s remark seem to be an attack on Hasan’s Muslim identity. It might be in dispute as to whether Hasan’s article amounts to a call for an Iranian nuclear bomb, but what is not in dispute is his coming to the defence of the vile Iranian regime, describing it as “surrounded on all sides by virulent enemies” and he doubts whether Iran is looking to create a nuclear bomb when he gives credence to the regime’s rhetoric that its “goal is only to develop a civilian nuclear programme, not atomic bombs”. And so Bozier’s comment is not so different from those by people who tell apologists for Hamas to move to Gaza if they love Hamas so much. It’s the same with telling Hasan to go to Tehran. It isn’t a racist slur. And in reality, and Hasan must know this, the equivalent far-left racial slur against British Jews is for us to bugger off to Russia. I, myself, was once told to go back to Poland at an anti-Israel event in London. So what a nice change it would be for British Jews to be told to “bugger off to Tel Aviv”. Implicit in such a suggestion would at least be a recognition of the Jewish connection to Israel, a connection which both the Palestinian leadership and the far-left refuse to make. But it wasn’t like that before 1948 when the common refrain of racists in the UK was for Jews to go back to Palestine. After 1948 it became politically inconvenient for the racists to suggest Jews go back to Israel, so Poland and Russia are now the new hot spots designated for us by the far-left, irrespective of the fact that Jews got slaughtered there in their millions by the Nazis. And how ironic that Hasan now chooses to employ British Jews in his defence when he has previously shown us such disregard with his casual attitude to anti-Semitism. So, Mehdi, by all means hate Israel, excuse anti-Semitism and support the Iranian regime if you are that way inclined but please don’t try to use British Jews in your defence when it suits you politically. And if anyone does tell me to “bugger off to Tel Aviv” I will be happy that, finally, they will have stopped trying to force me back to Poland. 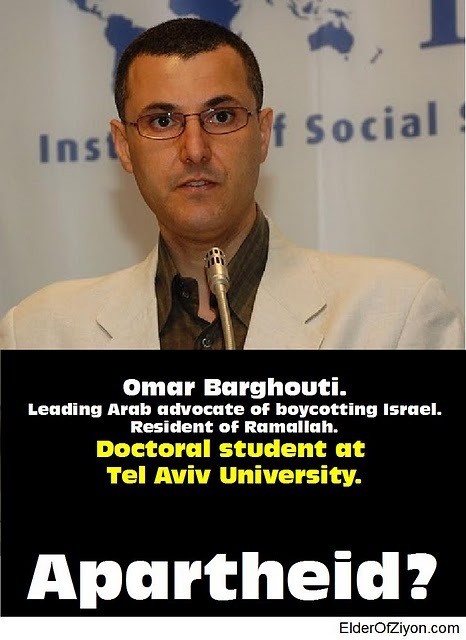 Omar Barghouti: The non-Israel-boycotting Israel boycotter. A foul stench of hypocrisy hung in the air last night as Omar Barghouti spoke about his new book BDS: Boycott, Divestment, Sanctions. The Global Struggle for Palestinian Rights at the London Review Bookshop. Barghouti unashamedly studies in Tel Aviv. He consumes Israeli goods en masse and says he would take Israeli live-saving medicine should he ever require it. “I have no choice. I don’t know what you think about Arabs but we are not suicidal,” was his answer to my question on that last point. He was being slightly disingenuous as my question was not about Arabs, but him specifically. That said, there are more than just a few Arabs who are suicidal and who think nothing of taking the lives of the innocent with them in the act, but when have you heard any condemnation of this from the so-called protectors of human rights within the BDS movement? I couldn’t understand why, out of choice, Barghouti studies in a country that he so despises. He also studied in America, the one country he blames for its rock solid support of Israel. But he argued that he has the right to be in Israel because he is a refugee and has the right to return there. He was born in Qatar and spent his first eleven years in Egypt. On the question of consuming Israeli goods, once again, he argued he has no choice as he lives in Israel. He claimed that he couldn’t find anyone to debate him about the ethics of a boycott “so we are debating with ourselves”. But, he said, he had set out all the questions and answers about boycotting Israel in his book. But it was only recently that Prof. Daniel Hochhauser destroyed Dr. John Chalcraft’s arguments on this exact same topic at the London (or is that Libyan?) School of Economics. There are many more people who can also demolish Barghouti’s arguments and show up the BDS movement for the purely anti-Semitic movement that it is. There I go playing the anti-Semitism card, which is exactly what Barghouti told the audience that Israel’s supporters do, but he implored them to be brave and to continue making the case for boycotts despite such allegations. But if a movement does not propose a boycott of America, Britain, China, Russia and Turkey etc. for the occupations that they are all embroiled in then I really don’t know how a movement can consider itself to be anything other than anti-Semitic. Perhaps Barghouti addresses this point in his book. 1. Ending the occupation and dismantling the wall. 2. Giving the Arab Palestinian citizens of Israel complete equality. 3. Respecting the rights of the Palestinians to return under UN Res. 194. Like Chalcraft he claimed that the boycott only targets institutions, not individuals although, as Hochhauser, pointed out individuals belong to institutions and so people are, in effect, being targeted individually. He described settlement products as “contraband”, which should be seized on entry to the UK, and claimed that the BDS movement had achieved “success beyond our dreams”. The call, he said, was issued in July 2005 but the movement has so far achieved more than the anti-apartheid movement did in 20 years and now included a boycott by the Trades Union Congress that covers some seven million workers and a cultural boycott by the likes of Meg Ryan, Roger Waters and The Pixies etc. Even if his claims were true, surely the boycott movement would be even more successful if he was also boycotting Israel. Barghouti would, no doubt, argue that he is effecting change from within Israel. He is part of “Boycott From Within”, but claimed repression is on the rise against Israeli citizens who support BDS, although, apparently, the Foreign Ministry recognises that Israel “will lose its last veneer of democracy in the West” should this continues. He cited Ilan Baruch who resigned from foreign service claiming that Israel needs to study “the South African experience”. Baruch had, however, recently been turned down for the post of ambassador to Egypt. Barghouti claimed that mainstream Israeli officials, and even Mossad, now think Israel is “a pariah”. The main problem for BDS is that, as Barghouti stated, Israel’s economy is “triple A rated” and so the movement must go for strategic victories like those against Veolia, which is responsible for building transport links in Israel. He claimed Veolia had been trying to sell its share in the Jerusalem light railway project, but that there were no buyers. But he did reveal doubts over the so-called Palestinian right of return. He questioned “whether it is feasible or not”, despite this being one of the three main objectives of the BDS movement! In summary, Barghouti is taking the very best that Israel has to offer and is allowed to publicly air his criticisms while, hypocritically, denouncing Israel as being undemocratic and an apartheid state. Israel feeds him, educates him, houses him, clothes him and looks after him medically, all while he attempts to destroy it from within. 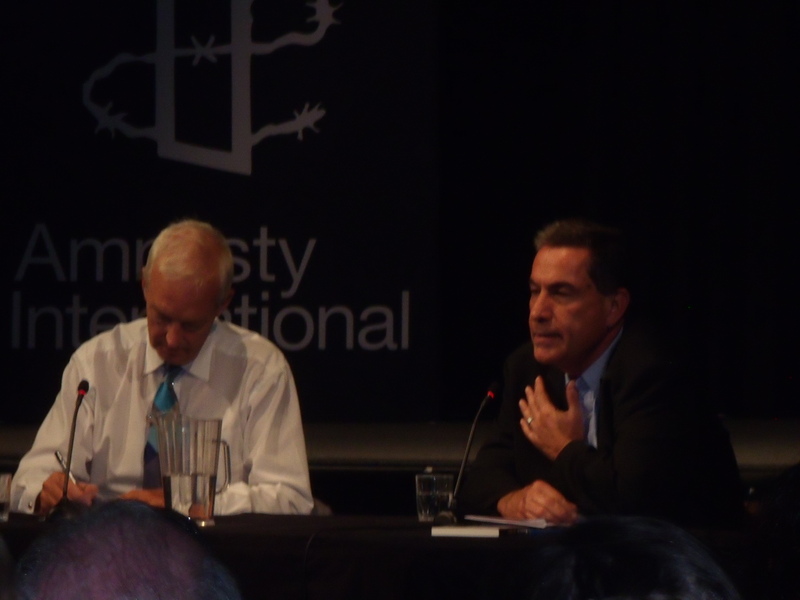 I went to hear Gideon Levy talk at Amnesty in London last night. He’s in the UK to promote his book The Punishment of Gaza and last night he was in conversation with John Snow (Snow presents Channel 4’s Seven O’clock news and seems fond of chairing anti-Israel events). It was nice to be actually let in unlike my last attempt. This event was co-presented by Palestine Solidarity Campaign and Jews for Justice for Palestinians, the latter organisation being more open to dialogue than some might give credit. I hope being barred from a public debate on Israel/Palestine because people don’t like what I write won’t become de rigeur, but you never know. Back to Levy. From what I had read about this tour I was expecting the devil incarnate to walk into the packed auditorium breathing fire from its nostrils. It didn’t happen. Maybe in my old age I am becoming desensitised to the ubiquitous unsubstantiated accusations of racism and apartheid that are made, like they were last night, against Israel that they don’t anger me anymore. Levy saw Operation Cast Lead (OCL) not as a war but as a brutal operation against a civilian population. He paid tribute to the fact that Israel was always the first on the scene to help in international crises like in Mexico, Turkey and Haiti. “There have been worse occupations in history but not where the occupier felt so good about itself. We are the first occupiers in the world to say that we are the victim and Israelis believe the IDF is the most moral army in the world, ” he said. He answered: “We were trained to think we are very moral but that Palestinians were not human beings like us. Dehumanisation is the only tool which enables us to maintain the occupation and feel good about ourselves. It is wall-to-wall now. Even the peaceniks don’t feel the Palestinians are human beings”. He told us how two Israeli dogs being killed during OCL garnered more media coverage than the deaths of hundreds of Palestinians. The dogs’ funerals and interviews with the owners were all over the front pages while Palestinian deaths were only mentioned on pages 15 and 16: “In Israel two Israeli dogs are worth more than hundreds of Palestinians,” he concluded. Levy said that a crowd of the size at Amnesty to hear him would never turn out in Tel Aviv and that Haaretz, the newspaper he writes for, is an island with a small readership. He spoke of the ever growing file labelled “Subscription cancellations due to Gideon Levy”: “I get full freedom to write for Haaretz but Haaretz is losing influence,” he said. He recalled the 400,000 Israelis who protested after the 1982 Sabra and Shatilla massacres which, he said, were not even carried out by the Israelis but thought that that size protest would not occur now. He has been described as a “self-hating Jew” and “an enemy of Israel”. (When Shlomo Sand came to the UK to promote his anti-Zionist polemic, The Invention of the Jewish People, he said it was top of the best-seller list in Israel. On the question of boycotting Israel Levy said that although he cannot call for a boycott himself, because he is Israeli, it is a legitimate weapon especially as Israeli uses it against Gaza, Hamas and Iran. He was asked whether boycotts are racist because they target Jewish Israelis, even those opposed to the settlements. He failed to address this question properly but he did say that boycotters should read the label first and boycott only if a product is from the West Bank. Levy’s main complaint is that he feels so alone in Israel. He feels the drama is all going on in Israel’s backyard and yet there is no one covering it. He said there is no censorship in Israel, only self-censorship by journalists. Despite all the above Levy is not actually an anti-Zionist. He called for the return of Palestinians to a Palestinian state and a limited return of some 500,000 to Israel including an admission of liability from Israel for what happened in 1948 and compensation for the non-returning refugees. “What happened in 1948 is an historic injustice but it happens in wars. Israel is a fait accomplit so let’s move to a new chapter. The Jews had a right to settle in Palestine but the Palestinian rejection of the partition plan should not have led to the expulsion of 650,000 from their villages,” he said. Levy claims that no one in Israel cares about the Palestinians and he cites Tel Aviv as the best example of this. But then again he would hear the same complaints from the residents of Sderot who also think that the rest of Israel doesn’t care about the bombs that are regularly fired at them from Gaza. I had a couple of nice chats afterwards and one with someone in charge of the Northern Section of the TUC who said that a full TUC boycott of Israel is coming. I asked whether the TUC had ever considered a boycott of Britain or America due to NATO forces occupying Afghanistan. He said it was impossible to boycott Britain but there is every possibility of a boycott of America being passed. I’d like to see them try! Keep an eye on the TUC Conference, 13th-16th September.